Scott Johnson is a highly-regarded and experienced coach who is Scotland's director of rugby. Johnson represented New South Wales Waratahs and Australia U21s as a fly-half or centre during his playing career. But it's as a coach that he's made the biggest impact. He made his mark as an assistant coach with NSW Waratahs and Australia A, which led to Graham Henry inviting him to join him in the Wales set up as skills coach. After assisting Henry and his successors Steve Hansen and Mike Ruddock, Johnson took over as head coach of Wales for three matches. 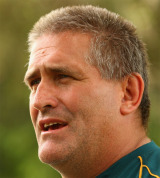 Prior to the 2007 Rugby World Cup, Johnson joined the Australian set-up as an attack coach, but he was released when Robbie Deans took over as the Wallabies' head coach. He had a brief stint in charge of the USA before being appointed as the Ospreys' director of rugby in 2009 and would go on to steer them to the Magners League title. He would part company with the region during the 2011-12 season to link up with Scotland as senior assistant to head coach Andy Robinson. Following Robinson's departure from the Murrayfield hot-seat, Johnson was appointed interim head coach for the 2013 Six Nations and after impressing, he took on the director of rugby role with the Scottish Rugby Union.